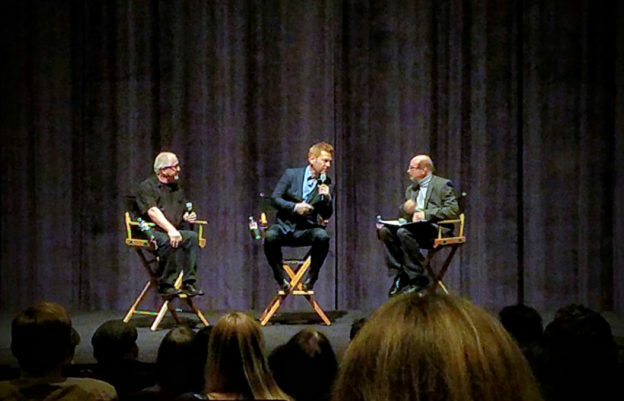 The nice people at Fox asked me to conduct a 40-minute Q&A with actor-director Kenneth Branagh and composer Patrick Doyle after a screening of Murder on the Orient Express in the studio’s beautiful and great-sounding Zanuck Theatre. This was one of those evenings when I was able to remind myself how lucky I am to live here and get to meet (and interview) some of the artists who make the movies we love. Branagh was both articulate and expansive, telling amusing stories about the shooting of Orient Express (and that wild moustache he dons as Hercule Poirot), while the always delightful Doyle talked about working with Michelle Pfeiffer about the song he and Branagh penned for the film’s finale. A large crowd of members from various guilds attended. This entry was posted in and tagged 20th Century-Fox, Kenneth Branagh, Murder on the Orient Express, Patrick Doyle on December 9, 2017 by Jon Burlingame.